Matthew Ebden celebrates breaking Dominic Thiem at the Shanghai Masters. 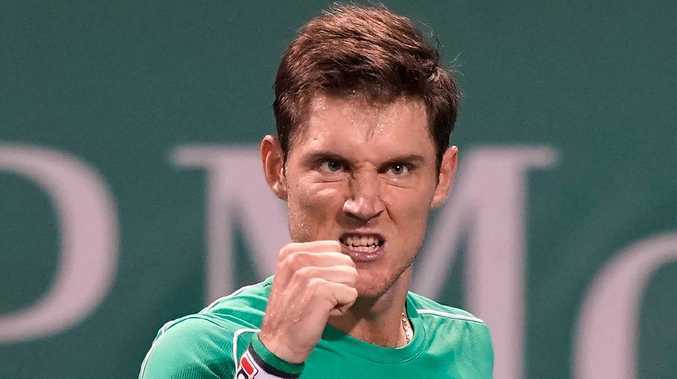 AUSSIE Matthew Ebden has registered the biggest win of his 13-year professional career, downing world No.7 Dominic Thiem from the second round of the Shanghai Masters. Journeyman Ebden, who has had a breakout season at 30 years of age, hung tough to beat the French Open finalist 6-4 6-7 (10-8) 7-6 (7-4). After breaking the Austrian's serve to lead 6-5, Ebden had a match point only to lose it when Thiem struck flukey let cord. He'll now take on German Peter Gojowczyk for a spot in the quarter-finals, another win likely to propel him into the world's top 40 for the first time in his career. Meanwhile Alex de Minaur's late season charge has continued with the Australian winning through to the second round. De Minaur held his nerve to beat big-serving Canadian Vasek Pospisil, 6-4 7-6 (7-4). The 19 year-old held on to an early break and kept his nose ahead in the first set. Pospisil couldn't crack the world No.33, blowing five break point opportunities including four in one game. 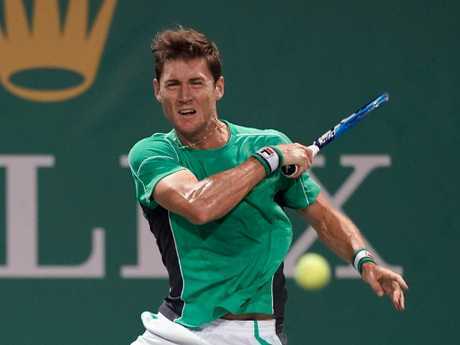 Matthew Ebden returns a shot to Dominic Thiem during the second-round match. Games stayed on serve in the second set which went to a tiebreaker. De Minaur then made quick inroads into the Canadian's serve, streaking ahead to a 6-1 advantage. It took four match points but he eventually served out the match. The Sydneysider will look to capture more rankings points in the Masters series tournament as he closes in on a top 32 ranking and seeding for next year's Australian Open. De Minaur will next take on French qualifier Benoit Paire, who upset 15th seed Pablo Carreno Busta 6-3 6-4. But waiting in the wings for the newly minted Australian No.1 is world No.5 Alexander Zverev who shapes as a potential round of 16 opponent. Novak Djokovic was also a second round winner, beating Jeremy Chardy 6-3 7-5. Other first round winners on Tuesday included Daniil Medvedev, Richard Gasquet, Kyle Edmund and Hyeon Cheung.